12 of the weirdest turntables ever made | What Hi-Fi? Turntables with a twist. That's what we have here. Traditional record players all tend to follow a basic form factor, but what if you want something a little different? We've scoured the web to bring you some of the weirdest, most interesting designs from over the years. We've got something for everyone, including a Lego turntable, an underwater deck and even one that floats in mid air. It might sound like a whopper, but the Soundburger (also known as the AT727) was actually a real turntable. Audio-Technica launched the player in the mid-1980s and as you can probably guess, it got the name from the fact it looks like a burger when a record is sandwiched between platter and lid. 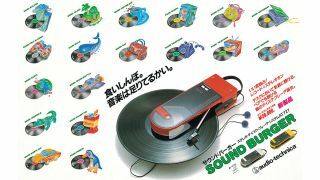 Battery or mains-powered, the Soundburger was a belt-driven, two-speed (33⅓ and 45rpm) deck with its own arm and cartridge. Its platter was only 9cm in diameter which helped keep the design streamlined. It cost £89 and was available in red, yellow or blue. The Miniot Wheel looks like a turntable with all the main bits missing. Where’s the arm and cartridge? All the main components are inside the platter, so the turntable actually plays the side of the record that’s facing down. The laminated mahogany tonearm is fitted with an Audio-Technica AT95E cartridge which, according to Miniot, has been fine-tuned “for damping, resonance and weight distribution”. The control stick doubles as the spindle and allows you to play, stop and skip tracks, and control the volume for the built-in headphone socket. The Miniot Wheel is available in three finishes: cherry, mahogany and walnut. You can pre-order it now for €650 and there’s also a limited edition version available for €1000 (or €800 if pre-ordered). Portable? Check. Vertical? Check. The Sony PS-F5 ticked a lot of boxes. It was born in 1983 and ran off AA batteries or its external power supply. The turntable combined a linear tracking, direct drive design, with a manual clamping system which kept your record in place whether horizontal or upright. Extendable feet helped with stability. The PS-F5 could play 7in and 12in records and if you happened to turn up somewhere with no speakers or amp, you (and a friend) could enjoy audio through its twin headphone sockets. There’s no turntable quite like the Mag-Lev Audio ML1. The platter hovers in place like a UFO holding its landing pattern, using magnets to rotate and keep itself in position. There are no moving parts inside, no belt and no motor. The platter balances on its feet when not in use, but once the tonearm is moved into position, the feet retract, leaving the ABS plastic and glass fibre platter suspended in mid-air. It’s a semi-automatic deck that works at both 33⅓ and 45rpm and comes with a pre-fitted Pro-Ject 9cc tonearm and Ortofon OM 10 cartridge. Pricing starts at £2450. We all know you can build pretty much anything from the dinky Danish bricks, so we shouldn’t be surprised that a fully-fledged Lego record player surfaced in 2015. It was built by a chap called Hayarobi, who’s also been responsible for a number of other wacky Lego creations over the years. Named ‘The Planet’, the turntable uses 2405 pieces including a Lego Power Functions Battery Box and M-Motor. There’s a Lego power button and a Lego switch for 33 and 45rpm records. Lego tyres have been used to help the tonearm’s counterbalance. The only non-Lego part is the Audio-Technica 1Ea cartridge. Dubbed “the world’s first intelligent turntable”, the Love has been designed to be smarter than your average record player. The main unit looks like a chunky mobile phone. Using its linear tracking sensor, built-in cartridge and stylus, the Love can read your records and stream them to speakers or headphones over Bluetooth. It works with 7in, 10in and 12in vinyl at speeds of 33⅓ and 45rpm. There’s even a Love app for iOS and Android, which allows you to control playback, speed, volume and to skip track. It’s connected to a database which helps set the speed automatically and allows the track listing and album art to be shown on your device. The Love turntable is available to pre-order now for $329. Mention the word 'turntable', and a dinky plastic camper van isn’t the first image that springs to mind. But the Stokyo Record Runner is a design that’s been doing the rounds for over 35 years, and still claims to be the world’s smallest record player. Everything is built in, including the motor, amplifier and speaker. The stylus and cartridge have both been sourced from Audio-Technica. All you need to do is place it on a vinyl record, flick the power switch and the Record Runner will do the rest. Just make sure you’ve got a steady supply of AAA batteries to hand. The Finial LT-1 demonstrated that you don’t need a stylus to read a record - a laser beam will do just fine. The benefits are simple: nothing physical touches the record, so your vinyl won’t wear and you don’t get any tracking noise. A prototype LT-1 was launched at CES 1986 with a $2500 price tag but any chance of success was ruined by an economic recession and, more importantly, the emergence of the good ol’ compact disc. The Finial player never made it into production, but the patents were sold to a Japanese turntable maker called BSR which then created the company ELP Japan. The ELP-1XA went on sale in 1997 for $20,500 and used two lasers to read the groove and three to control the head. Over time the 1XA has evolved into two separate models, the LT-basic or the LT-master, with the former rumoured to cost around $15,000. This dinky, 3-inch deck was announced in January this year as a novel way of marking Record Store Day 2019. Three-inch vinyl isn't exactly a new format – in Japan, decks this size are referred to as 8-ban record players. The miniature discs only hold around four minutes of music, so you’ll get a decent bit of exercise too. When the kings of 1980’s hi-fi engineering decided to make a turntable, you just knew it was going to be something special. The TX-1000 went above and beyond normal turntables because it was self-centering. It was actually designed to measure the accuracy of the hole in your vinyl and it could adjust the positioning of its platter to compensate. A measuring arm hidden away under the left hand panel could swing into action at the press of a button, its sole job to measure the accuracy of the hole. Too big and you’re at risk of wow issues, also known as low frequency timing (or pitch) errors. The bigger the discrepancy, the bigger the problem. Once the record was measured, motors underneath the platter were able to move it around and place it the optimum position for playback. Clever. Ever wondered how a turntable sounds underwater? Artist Evan Holm created a big water feature with a submerged turntable as its focal point. The controls are built into a tree that's also part of the installation for an extra touch. If your budget for a new deck is quite literally a fiver, you could use it to create your own record player. It sounds like black magic, but it actually works. A YouTuber by the name of Michael Ridge filmed himself bringing the note to life. Of course, the note doesn’t work on its own. You need a contact microphone and amplifier to deliver the sound. We’re not sure your records will appreciate it, but it’s nice to know the option’s there.